Do medications work as promised? Ask questions! Medications can be beneficial and safe lives; however, some may not work as well as promised. 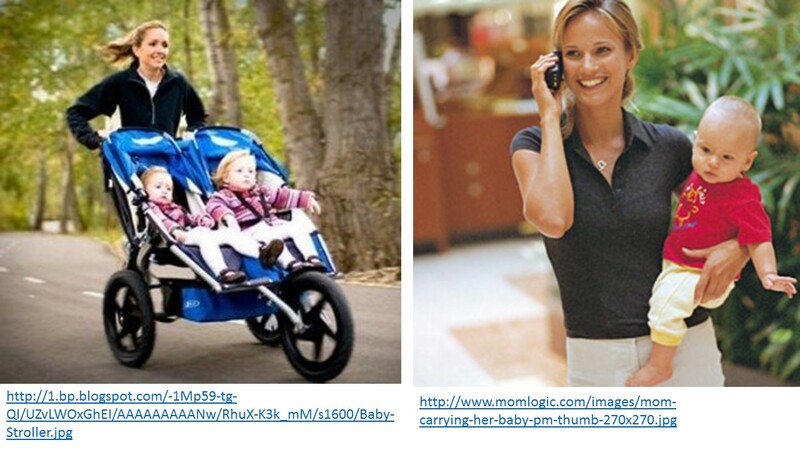 In some cases, they may do more harm than good as illustrated by the following examples. There is weak or no evidence of effectiveness for the long term use of any opiod (morphine, fentanyl, oxycodone, methadone and hydrocodone) in the treatment of chronic pain (Perlin, 2015). As the Center for Disease Control and Prevention reports, “Since 1999, the amount of prescription painkillers prescribed and sold in the U.S. has nearly quadrupled, yet there has not been an overall change in the amount of pain that Americans report. Over prescribing leads to more abuse and more overdose deaths.” More than 16,000 people a year die from prescription drug overdose (CDC, 2016). For a superb discussion of the treatment of chronic pain, see the recently published book by Cindy Perlin, The truth about chronic pain treatments. Selective serotonin re-uptake inhibitor such as Paxil and Prozac (SSRI) are much less effective than promised by pharmaceutical companies. When independent researchers (not funded by pharmaceutical companies) re-analyzed the data from published and unpublished the studies, they found that the medication was no more effective than the placebo for the treatment of mild and moderate depression (Ioannidis, 2008; Le Noury et al, 2015). In addition, the SSRIs (paroxetine and Imipramine) in treatment of unipolar major depression in adolescence may cause significant harm which outweigh any possible benefits (Le Le Noury et al., 2015). On the other had, exercise appears as effective as antidepressants for reducing symptoms of mild to moderate depression (Cooney et al., 2013). Despite the questionable benefits of SSRI medications, pharmaceutic industry to posted $11.9 billion dollars in 2011 global sales (Perlin, 2015). When medications are recommended, ask your provider the following questions (Robin, 1984; Gorter & Peper, 2011). Why are you prescribing the medication? What are the risks and negative side effects? How do I know when the medication is working? What will you do if the medication does not work? How many patients do you need to treat before one patient benefits? Can you recommend non-pharmaceutical options? How many patients need to be treated with the medication before one patient benefits? How many will experience negative side effects? The data can be discouraging. As Daniel Levitin, neuroscientist at McGill University in Montreal and Dean at Minerva Schools in San Francisco, points out, it takes 300 people to take statins for one year before one heart attack, stroke or other serious event is prevented. However, 5% of all the people taken statins (the of drug of choice to lower cholesterol) will experience debilitating adverse effects such as severe muscle pain and gastrointestinal disorders. This means that you are 15 times more likely to suffer serious side effect than being helped by the drug. Nevertheless, the CDC reported that during 2011–2012, more than one-quarter (27.9%) of adults aged 40 and over used a prescription cholesterol-lowering medication (statins) (Gu, 2014). Before making any medical decision when stressed, watch the superb 2015 TED London presentation by neuroscientist Daniel Levitin, How to think about making a decision under stress. Overdiagnosed: Should I have more tests or treatments? One Computerized tomography (CT) scan of the abdomen and pelvis will expose you to more radiation than the residents of Fukushima, Japan absorbed after the Fukushima Daiichi nuclear power plant accident in 2011. –Consumer Reports, March 2015, Vol.80 No.3, 39. High-risk patients with heart failure and cardiac arrest hospitalized in teaching hospitals had a significantly lower 30-day mortality when admitted during dates of national cardiology meetings (70% survival when doctors attended meeting as compared to 60% survival when doctors did not attend the meetings). –-Jena et al, 2014. I feel healthy but worry that cancer could be lurking in the background, should I do a preventative body scan? I sometimes have slightly higher blood pressure especially when the doctor measures it. It is probably borderline, should I go on medication? Should I have my PSA tested? I am a healthy fifty year old, should I have a mammogram? Genuine belief, although not evidence based, that an early intervention and more testing would reduce suffering. Financial incentives for the parties that perform testing and preventative screening or encourage increased drugs sales for borderline conditions for which the risk and benefits are not well documented. Fear of lawsuits by medical providers. If a patient develops an illness which possibly could have been diagnosed by screening, even though the screening may not have affected the actual outcome, the health professional could be sued. Why are you doing this test or procedure? What are the risks of treatment and what are the benefits of treatment? How will the test results change the treatment strategy? Are there less invasive strategies that could be used? 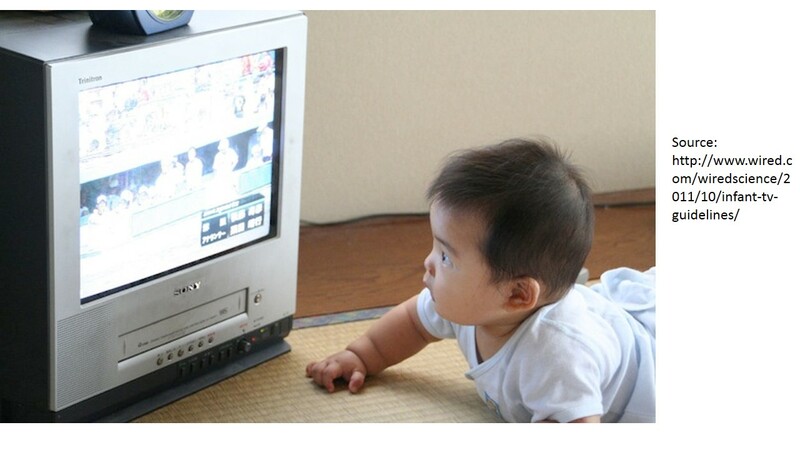 Be very careful of exposing yourself and especially children to CT scans. It is estimated that for every 1000 children who have an abdominal CT scan, one will develop cancer as a result (2015, Consumer Report, March 16). To be able to navigate the complexities of diagnosis and to understand the risks and benefits of treatment and testing, read the recent two articles in the New York Times, Can this treatment help me? There is a statistic for that, How to Measure a Medical Treatment’s Potential for Harm and the superb book, Over-diagnosed-Making people sick in the pursuit of health, by Drs. H. Gilbert Welch, Lisa M Schwartz, and Steven Woloshin who are professors at Darthmouth Institute for Health Policy and Clinical Practice. This book is a must read for every patient and health care provider. Carroll, A.E. & Frakt, A. (2015). How to Measure a Medical Treatment’s Potential for Harm. New York Times, February 2. Frakt, A. & Carroll, A.T. (2015). Can This Treatment Help Me? There’s a Statistic for That, New York Times, January 26. Welch, H.G., Schwartz, L.M., & Woloshin, S. (2011). 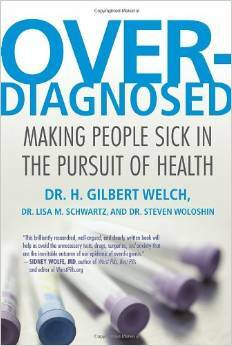 Over-diagnosed-Making people sick in the pursuit of health. Boston: Beacon Press. Should I take meds for depression or anxiety? Read Whitaker’s book first! The recent book, Anatomy of an Epidemic, by Robert Whitaker is a must read for anyone who is planning or taking medications to treat mood disorders such as depression, anxiety, or panic attacks. His in-depth evidence based book, which reads like a novel, suggests that psychiatric drug benefits are mainly a myth and contribute significantly to creating life-long dysfunction and worsening of the symptoms. He cites study after study demonstrating this for depression, children with ADHD, biopolar disorder, panic attacks, anxiety and even schizophrenia. For example he cites a Canadian study of 1,281 people who went on on short-term disability for depression. Only 19 percent of those who took an antidepressant ended up on long-term disability, versus 9 percent of those who didn’t take the medication. 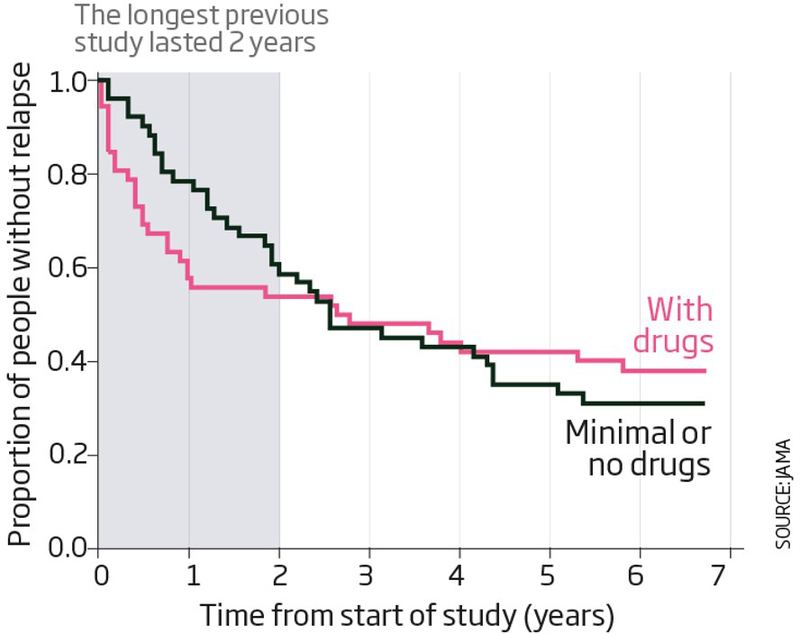 More importantly, when people are treated for panic attacks with benzodiazepine such as Xanax, the placebo groups does much better in the long term than the drug treatment group after medication is tapered off. 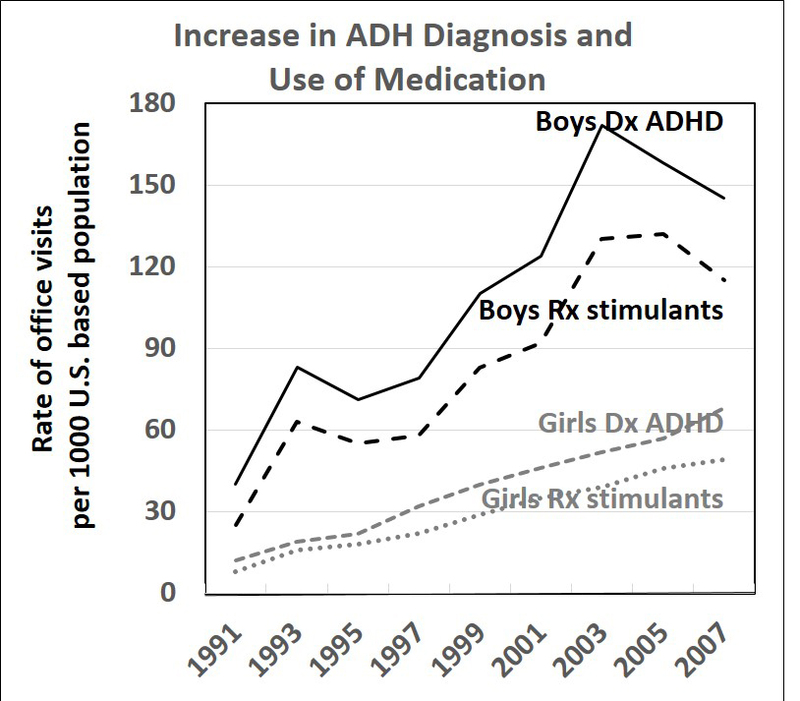 Whitaker illustrates this concept by showing the following research data that was part of the FDA approval for the medication. 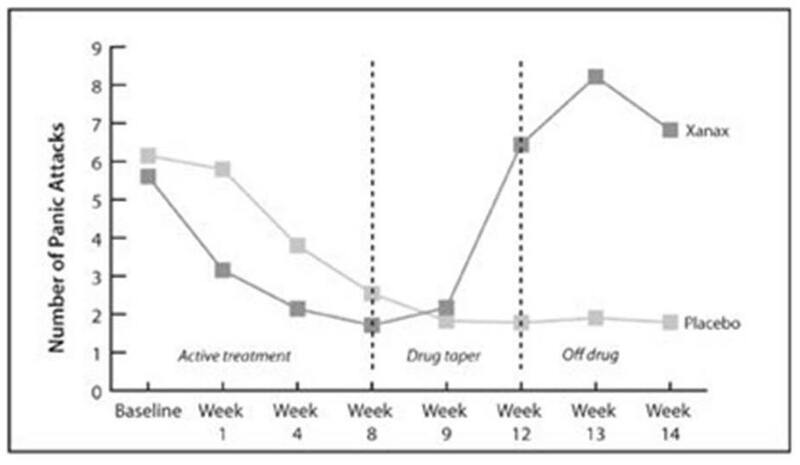 This Upjohn’s study of Xanax, patients were treated with the drug or placebo for eight weeks. Then this treatment was slowly withdrawn (weeks 9 through 12), and during the last two weeks patients didn’t receive any treatment. The Xanax patients fared better during the first four weeks, which is the result that the Upjohn investigators focused on in their journal articles. However, once the Xanax patients began withdrawing from the the drug, they suffered many more panic attacks than the placebo patients, and at the end of the study were much more symptomatic. Source: Ballenger, C “Alprazolam in panic disorder and agoraphobia.” Archives of General Psychiatry 45 (1988): 413–22. Pecknold, C “Alprazolam in panic disorder and agoraphobia.” Archives of General Psychiatry 45 (1988): 429–36. From: Whitaker, Robert (2010-03-31). Anatomy of an Epidemic: Magic Bullets, Psychiatric Drugs, and the Astonishing Rise of Mental Illness in America (p. 297). This book and the scientific evidence suggests that non-pharmacological treatment approaches should be the first strategy for treatment–it may save your life.